The new Festool dust extractors have arrived, and they tick every box. They feature a touch control system as opposed to rotary knobs. This is more than just a subtle touch, as they add convenience. Lightweight, compact and sophisticated, the CTM MIDI and CTL MIDI extractors boast a host of innovative details. We take an in-depth look at these below. The difference between the CTM MIDI & CTL MIDI dust extractors is that the former is approved for dust class M, while the latter is an L class extractor. The CTM MIDI is advised if you’re working with hazardous materials, and is suitable for all wet and dry applications. It also removes 99.9% of dust with a limit value for occupational exposure > 0.1mg/m³, whereas the CTL MIDI’s value is 1.0mg/m³. 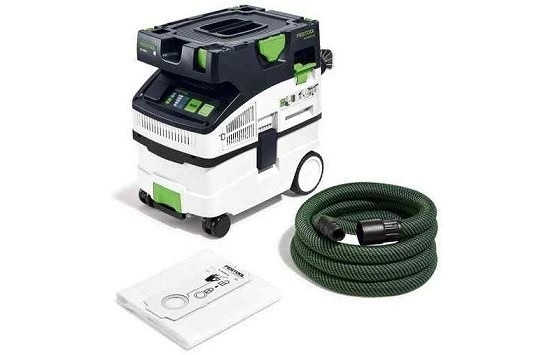 These Festool dust extractors provide on-site extraction for electric power tools for minor or brief sanding, routing, sawing and drilling work. Additionally, they work seamlessly with the Festool system to ensure maximum efficiency. Ideal for mobile use in service and installation work, they should also be used for final cleaning following a completed task. Furthermore, the CTM MIDI and CTL MIDI extractors are suitable for both wet and dry extraction. A special wet filter is, however, required for wet extraction when using the CTL MIDI. When extracting water, the LevelStop shuts down the extractor in good time and the turbine remains protected. Moreover, these Festool dust extractors feature integrated Bluetooth technology and are operated by an innovative touch control panel. This is extremely simple to operate, even when wearing gloves or in a dirty environment. The extractor is set to automatic mode as soon as it is switched on. In addition it is worth mentioning the smooth suction hose, which allow the extractors to glide over all surfaces and edges perfectly. To conclude, the new Festool dust extractors are highly versatile, mobile and efficient. They protect your health and are easy to transport in any vehicle, meaning they are equally useful in your workshop or on a customer’s site. On top of that, both 110v and 240v versions are available. Check them out at one of our showrooms. Alternatively, buy one here or here. Order before 17.30 for next working day delivery.